The use of the term 'music' is problematic within prehistory. It may be that, as in the traditional music of much of sub-Saharan Africa, the concept of 'music', as we understand it, was somewhat different. Many languages traditionally have terms for music that include dance, religion or cult. The context in which prehistoric music took place has also become a subject of much study, as the sound made by music in prehistory would have been somewhat different depending on the acoustics present. Some cultures have certain instances of their music intending to imitate natural sounds. In some instances, this feature is related to shamanistic beliefs or practice. It may also serve entertainment (game) or practical functions (for example, luring animals in hunt). It is likely that the first musical instrument was the human voice itself, which can make a vast array of sounds, from singing, humming and whistling through to clicking, coughing and yawning. (See Darwin’s Origin of Species on music and speech.) The oldest known Neanderthal hyoid bone with the modern human form has been dated to be 60,000 years old, predating the oldest known Paleolithic bone flute by some 20,000 years, but the true chronology may date back much further. Music can be theoretically traced to prior to the Paleolithic age. The anthropological and archaeological designation suggests that music first arose (among humans) when stone tools first began to be used by hominids. The noises produced by work such as pounding seed and roots into meal is a likely source of rhythm created by early humans.The first rhythm instruments or percussion instruments most likely involved the clapping of hands, stones hit together, or other things that are useful to create rhythm. Examples of paleolithic objects which are considered unambiguously musical are bone flutes or pipes; paleolithic finds which are currently open to interpretation include pierced phalanges (usually interpreted as "phalangeal whistles"), bullroarers, and rasps. These musical instruments date back as far as the paleolithic, although there is some ambiguity over archaeological finds which can be variously interpreted as either musical or non-musical instruments/tools. Another possible origin of music is motherese, the vocal-gestural communication between mothers and infants. This form of communication involves melodic, rhythmic and movement patterns as well as the communication of intention and meaning, and in this sense is similar to music. Miller suggests musical displays play a role in "demonstrating fitness to mate". Based on the ideas of honest signal and the handicap principle, Miller suggested that music and dancing, as energetically costly activities, were to demonstrate the physical and psychological fitness of the singing and dancing individual to the prospective mates.Communal singing by both sexes occurs among cooperatively breeding songbirds of Australia and Africa such as magpies, and white-browed sparrow-weaver. The field of archaeoacoustics uses acoustic techniques to explore prehistoric sounds, soundscapes and instruments, and has included the study of ringing rocks and lithophones, of the acoustics of ritual sites such as chamber tombs and stone circles, and the exploration of prehistoric instruments using acoustic testing. Such work has included acoustic field tests to capture and analyse the impulse response of archaeological sites; acoustic tests of lithophones or 'rock gongs'; and reconstructions of soundscapes as experimental archaeology. An academic research network, the Acoustics and Music of British Prehistory Research Network, has explored this field. In 1986, several gudi (literally "bone flutes") were found in Jiahu in Henan Province, China. They date to about 6000 BCE. They have between 5 and 8 holes each and were made from the hollow bones of a bird, the red-crowned crane. At the time of the discovery, one was found to be still playable. The bone flute plays both the five- or seven-note scale of Xia Zhi and six-note scale of Qing Shang of the ancient Chinese musical system. India has one of the oldest musical traditions in the world—references to Indian classical music (marga) are found in the Vedas, ancient scriptures of the Hindu tradition.The Divje Babe flute, carved from a cave bear femur, is thought to be at least 40,000 years old. Instruments such as the seven-holed flute and various types of stringed instruments, such as the Ravanahatha, have been recovered from the Indus Valley Civilization archaeological sites. Australian Aboriginal and Torres Straight Islander music includes the music of Aboriginal Australians and Torres Strait Islanders. Music has formed an integral part of the social, cultural and ceremonial observances of these people, down through the millennia of their individual and collective histories to the present day, and has existed for 40,000 years. 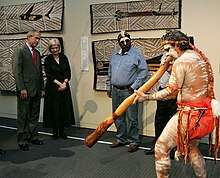 The traditional forms include many aspects of performance and musical instrumentation which are unique to particular regions or Indigenous Australian groups; there are equally elements of musical tradition which are common or widespread through much of the Australian continent, and even beyond. The culture of the Torres Strait Islanders is related to that of adjacent parts of New Guinea and so their music is also related. Music is a vital part of Indigenous Australians' cultural maintenance. A didgeridoo is a type of musical instrument that, according to western musicological classification, falls into the category of aerophone. It is one of the oldest instruments to date. It consists of a long tube, without finger holes, through which the player blows. It is sometimes fitted with a mouthpiece of beeswax. Didgeridoos are traditionally made of eucalyptus, but contemporary materials such as PVC piping are used. In traditional situations it is played only by men, usually as an accompaniment to ceremonial or recreational singing, or, much more rarely, as a solo instrument. Skilled players use the technique of circular breathing to achieve a continuous sound, and also employ techniques for inducing multiple harmonic resonances. Although traditionally the instrument was not widespread around the country - it was only used by Aboriginal groups in the most northerly areas . Used as a hand-held free reed instrument. Various cultures have used bullroarers as musical, ritual, and religious instruments and long-range communication devices for at least 19,000 years. Use of Bullroarers have also been documented in Ancient Greece, Britain, Ireland, Scandinavia, Mali, New Zealand, and the Americas, see Bullroarer. In 2008, archaeologists discovered a bone flute in the Hohle Fels cave near Ulm, Germany. The five-holed flute has a V-shaped mouthpiece and is made from a vulture wing bone. The researchers involved in the discovery officially published their findings in the journal Nature in June 2009. It is one of several similar instruments found in the area, which date to at least 35,000 years ago, making this one of the oldest confirmed find of any musical instruments in history. The Hohle Fels flute was found next to the Venus of Hohle Fels and a short distance from the oldest known human carving. On announcing the discovery, scientists suggested that the "finds demonstrate the presence of a well-established musical tradition at the time when modern humans colonized Europe". Scientists have also suggested that the discovery of the flute may help to explain why early humans survived, while Neanderthals became extinct. 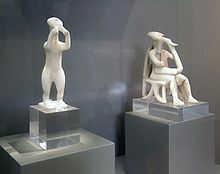 On the island of Keros (Κέρος), two marble statues from the late Neolithic culture called Early Cycladic culture (2900-2000 BCE) were discovered together in a single grave in the 19th century. They depict a standing double flute player and a sitting musician playing a triangular-shaped lyre or harp. The harpist is approximately 23 cm (9 in) high and dates to around 2700-2500 BCE. He expresses concentration and intense feelings and tilts his head up to the light. The meaning of these and many other figures is not known; perhaps they were used to ward off evil spirits or had religious significance or served as toys or depicted figures from mythology. Aurignacian flute made from a vulture bone, Geissenklösterle (Swabia), which is about 35,000 years old. long, tapered at one end, but without any finger holes. They may once have been strapped together. The oldest flute ever discovered may be the so-called Divje Babe flute, found in the Cerkno Hills , Slovenia in 1995, though this is disputed. The item in question is a fragment of the femur of a juvenile cave bear, and has been dated to about 43,000 years ago. However, whether it is truly a musical instrument or simply a carnivore-chewed bone is a matter of ongoing debate. In 2012 some flutes, that were discovered years earlier in the Geißenklösterle cave, received a new high-resolution carbon-dating examination yielding an age of 42,000 to 43,000 years. For thousands of years, Canada has been inhabited by Indigenous Peoples [Aboriginal peoples in Canada] from a variety of different cultures and of several major linguistic groupings. Each of the Indigenous communities had (and have) their own unique musical traditions. Chanting - singing is widely popular, with many of its performers also using a variety of musical instruments. They used the materials at hand to make their instruments for thousands of years before Europeans immigrated to the new world. They made gourds and animal horns into rattles which were elaborately carved and beautifully painted. In woodland areas, they made horns of birchbark along with drumsticks of carved antlers and wood. Drums were generally made of carved wood and animal hides. These musical instruments provide the background for songs and dances. ^ a b Brown, RE (1971). "India's Music". Readings in Ethnomusicology. ^ "Inuit Throat-Singing". www.mustrad.org.uk. Retrieved 2019-02-24. ^ B. Arensburg; A. M. Tillier; B. Vandermeersch; H. Duday; L. A. Schepartz; Y. Rak (April 1989). "A Middle Palaeolithic human hyoid bone". Nature. 338 (6218): 758–760. doi:10.1038/338758a0. PMID 2716823. ^ a b Arroyos, Rafael Pérez (2003). Egypt: Music in the Age of the Pyramids (1st ed.). Madrid: Centro de Estudios Egipcios. p. 28. ISBN 8493279617. ^ Wilford, John N. (June 24, 2009). "Flutes Offer Clues to Stone-Age Music". Nature. The New York Times. 459 (7244): 248–52. doi:10.1038/nature07995. PMID 19444215. Retrieved June 29, 2009. ^ "Schwäbische Alb: Älteste Flöte vom Hohle Fels". www.spektrum.de (in German). Retrieved 2019-02-24. ^ "Music for cavemen". MSNBC. 2009-06-24. Retrieved 2009-06-26. ^ Clint Goss (2012). "The Wicklow Pipes / The Development of Flutes in Europe and Asia". Flutopedia. Retrieved 2012-01-09. ^ "Earliest music instruments found". 2012-05-25. Retrieved 2019-02-24. ^ Elaine Keillor; Tim Archambault; John M. H. Kelly (March 31, 2013). Encyclopedia of Native American Music of North America. ABC-CLIO. pp. 306–. ISBN 978-0-313-05506-5. ^ a b Patterson, Nancy-Lou (1973). Canadian native art; arts and crafts of Canadian Indians and Eskimos. Don Mills, Ont., Collier-Macmillan. p. 36. ISBN 0-02-975610-3. ^ "The Aboriginal Curatorial Collective". kingfisher (ACC/CCA). Archived from the original (PDF) on 2008-11-20. Retrieved 2009-10-28. ^ a b First Nations?.. Second Thoughts. by Thomas Flanagan (2nd ed.). 2008. pp. 12–28. ISBN 0-7735-3443-1. Parncutt, R (2009). "Prenatal and infant conditioning, the mother schema, and the origins of music and religion" (PDF). Musicae Scientiae, Special issue on Music and Evolution (Ed. O. Vitouch & O. Ladinig), 119-150. Archived from the original (PDF) on 2011-06-05. Hagen, EH and; Hammerstein P (2009). "Did Neanderthals and other early humans sing? Seeking the biological roots of music in the loud calls of primates, lions, hyenas, and wolves" (PDF). Musicae Scientiae. Wallin, Nils, Bjorn Merker, and Steven Brown, eds., The Origins of Music, (MIT Press, Cambridge, MA., 2000). ISBN 0-262-23206-5. Compilation of essays. Sound sample and playing instructions for reconstructed bone flutes. Information about a supposed Neanderthal flute found in Slovenia - the article written by Dr. Ivan Turk who discovered it.